Our lives have become more mobile as more of our gadgets have become portable. With MP3 players, camcorders, cameras and portable speakers we’re able to do lots of things on the move - so long as we have the battery power. Whatever the gadgets you rely on for commuting, travel, business or just everyday, we’ve got the batteries you need to stay powered up on the go. At home or away, when you run out of power it’s easier than ever to find affordable back-up batteries with our extensive range of multipacks and specialists battery types. From high-end DSLRs to TV remote controls and watches, we have a huge selection of affordable, reliable batteries to choose from. We stock every major brand, including trusted stalwarts like Duracell, as well as heavy-duty Hahnel battery packs for cameras. The most common battery types, like AA, AAA, C, D and 9V, are all available in money-saving multipacks, and there are plenty of rechargeable battery options to save you even more. 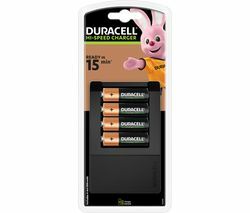 Our Duracell rechargeable AA and AAA batteries can be recharged hundreds of times. Even when they’re not in use they’ll also stay charged for up to six months, so you won’t have to recharge when you finally need to use them again. Our Lithium-ion rechargeable batteries charge up faster, so your devices are ready to use more quickly, and they last much longer than standard batteries. While lead acid batteries become damaged over time if not charged, failing to charge Lithium-ion batteries to 100% doesn’t cause any damage, resulting in a longer battery lifespan. Get even better value with our battery and charger packs so you have everything you need to keep yourself powered up for longer. Speedy and more economical, our chargers are capable of charging AA and AAA batteries in only 15 minutes. 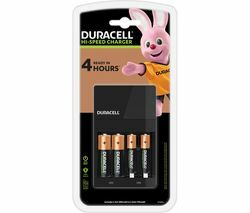 Whatever devices you use at home or on the go, our affordable Duracell batteries, Logic batteries and more will keep you charged up for less.